listen); names in other languages) is the capital and largest city of Serbia. 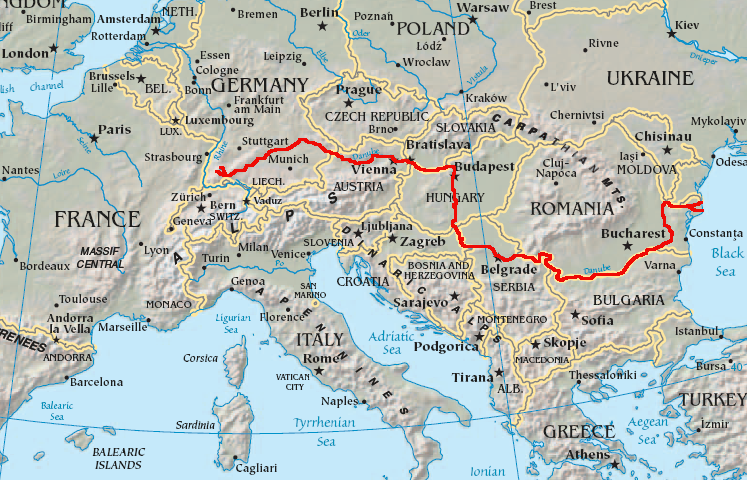 It is located at the confluence of the Sava and Danube rivers, where the Pannonian Plain meets the Balkans. Its name translates to White city. The city proper has a population of over 1.6 million; its metropolitan area within city limits is populated by 1.3 million people, making it one the largest cities of Southeastern Europe. One of the most important prehistoric cultures of Europe, the Vinča culture, evolved within the Belgrade area in the 6th millennium BC. In antiquity, Thraco-Dacians inhabited the region, and after 279 BC Celts conquered the city, naming it Singidūn. It was conquered by the Romans during the reign of Augustus, and awarded city rights in the mid 2nd century. It was settled by the Slavs in the 520s, and changed hands several times between the Byzantine Empire, Frankish Empire, Bulgarian Empire and Kingdom of Hungary before it became the capital of Serbian King Stephen Dragutin (1282–1316). In 1521, Belgrade was conquered by the Ottoman Empire and became the seat of the Sanjak of Smederevo. It frequently passed from Ottoman to Habsburg rule, which saw the destruction of most of the city during the Austro-Ottoman wars. Belgrade was again named the capital of Serbia in 1841. Northern Belgrade remained the southernmost Habsburg post until 1918, when the city was reunited. As a strategic location, the city was battled over in 115 wars and razed to the ground 44 times. Belgrade was the capital of Yugoslavia (in various forms of governments) from its creation in 1918, to its final dissolution in 2006. Belgrade has a special administrative status within Serbia and it is one of five statistical regions of Serbia. Its metropolitan territory is divided into 17 municipalities, each with its own local council. It covers 3.6% of Serbia's territory, and 22.5% of the country's population lives in the city. The city has been awarded many titles, including the nomination for European Capital of Culture 2020. Belgrade lies 116.75 metres (383.0 ft) above sea level and is located at the confluence of the Danube and Sava rivers. The historical core of Belgrade, Kalemegdan, lies on the right banks of both rivers. Since the 19th century, the city has been expanding to the south and east; after World War II, Novi Beograd (New Belgrade) was built on the left bank of the Sava river, connecting Belgrade with Zemun. Smaller, chiefly residential communities across the Danube, like Krnjača, Kotež and Borča, also merged with the city, while Pančevo, a heavily industrialized satellite city, remains a separate town. The city has an urban area of 360 square kilometres (140 sq mi), while together with its metropolitan area it covers 3,223 km2 (1,244 sq mi). Throughout history, Belgrade has been a crossroads between the West and the Orient. Belgrade lies on the transition zone of humid subtropical (Cfa) and humid continental (Dfa) climate zones, with four seasons and uniformly spread precipitation. Monthly averages range from 1.4 °C (34.5 °F) in January to 23.0 °C (73.4 °F) in July, with an annual mean of 12.5 °C (54.5 °F). There are, on average, 31 days a year when the temperature is above 30 °C, and 95 days when the temperature is above 25 °C. Belgrade receives about 690 millimetres (27 in) of precipitation a year, with late spring being wettest. The average annual number of sunny hours is 2,112. The highest officially recorded temperature in Belgrade was +43.6 °C (110 °F) on 24 July 2007, while on the other end, the lowest temperature was −26.2 °C (−15 °F) on 10 January 1893. The Paleo-Balkan tribes of Thracians and Dacians ruled this area prior to the Roman conquest. Belgrade was inhabited by a Thraco-Dacian tribe Singi; after the Celtic invasion in 279 BC, the Scordisci took the city, naming it "Singidūn" (dūn, fortress). In 34-33BC the Roman army led by Silanus reached Belgrade. It became the romanized Singidunum in the 1st century AD, and by the mid-2nd century, the city was proclaimed a municipium by the Roman authorities, evolving into a full fledged colonia (highest city class) by the end of the century. Apart from the first Christian Emperor of Rome who was born on the territory in modern Serbia in Naissus – Constantine I known as Constantine the Great – another early Roman Emperor was born in Singidunum: Flavius Iovianus (Jovian), the restorer of Christianity. Jovian reestablished Christianity as the official religion of the Roman Empire, ending the brief revival of traditional Roman religions under his predecessor Julian the Apostate. In 395 AD, the site passed to the Eastern Roman or Byzantine Empire. Across the Sava from Singidunum was the Celtic city of Taurunum (Zemun); the two were connected with a bridge throughout Roman and Byzantine times. In 442, the area was ravaged by Attila the Hun. In 471, it was taken by Theodoric the Great, who continued into Greece. As the Ostrogoths left for Italy, the Gepids took over the city. In 539 it was retaken by the Byzantines. In 577, some 100,000 Slavs poured into Thrace and Illyricum, pillaging cities and settling down. The Avars under Bayan I conquered the whole region by 582. According to Byzantine chronicle De Administrando Imperio, the White Serbs had stopped in Belgrade on their way back home stopped in Belgrade, asking the strategos for lands; they received provinces in the west, towards the Adriatic, which they would rule as subjects to Heraclius (610–641). When the Avars were finally destroyed in the 9th century by the Franks, it fell back to Byzantine rule, while Taurunum became part of the Frankish realm (renamed Malevilla). At the same time (around 878), the first record of the name Beligrad appeared, during the rule of Bulgarian Knyaz Boris I. For about four centuries, the city remained a battleground between the Byzantine Empire, the Kingdom of Hungary, Serbia and the Bulgarian Empire. Basil II (976–1025) installed a garrison in Belgrade. The city hosted the armies of the First and the Second Crusade; while passing through during the Third Crusade, Frederick Barbarossa and his 190,000 crusaders saw Belgrade in ruins. In 1427, Stefan's successor Đurađ Branković had to return Belgrade to the Hungarians, and Smederevo became the new capital. During his reign, the Ottomans captured most of the Serbian Despotate, unsuccessfully besieging Belgrade first in 1440 and again in 1456. As it presented an obstacle to their further advance into Central Europe, over 100,000 Ottoman soldiers launched the 1456 Siege of Nándorfehérvár, in which the Christian army under commander János Hunyadi successfully defended the city from the Ottomans, wounding Sultan Mehmed II. This battle has been characterized as having "decided the fate of Christendom"; the noon bell ordered by Pope Callixtus III commemorates the victory throughout the Christian world to this day. The First World War began on 28 July 1914 when Austria-Hungary declared war on Serbia. Most of the subsequent Balkan offensives occurred near Belgrade. Austro-Hungarian monitors shelled Belgrade on 29 July 1914, and it was taken by the Austro-Hungarian Army under General Oskar Potiorek on 30 November. On 15 December, it was re-taken by Serbian troops under Marshal Radomir Putnik. After a prolonged battle which destroyed much of the city, between 6 and 9 October 1915, Belgrade fell to German and Austro-Hungarian troops commanded by Field Marshal August von Mackensen on 9 October 1915. The city was liberated by Serbian and French troops on 5 November 1918, under the command of Marshal Louis Franchet d'Espérey of France and Crown Prince Alexander of Serbia. Since Belgrade was decimated as the front-line city, Subotica overtook the title of the largest city in the Kingdom for a short while. On 25 March 1941, the government of regent Crown Prince Paul signed the Tripartite Pact, joining the Axis powers in an effort to stay out of the Second World War and keep Yugoslavia neutral during the conflict. This was immediately followed by mass protests in Belgrade and a military coup d'état led by Air Force commander General Dušan Simović, who proclaimed King Peter II to be of age to rule the realm. Consequently, the city was heavily bombed by the Luftwaffe on 6 April 1941, when up to 24,000 people were killed. Yugoslavia was then invaded by German, Italian, Hungarian, and Bulgarian forces, and suburbs as far east as Zemun, in the Belgrade metropolitan area, were incorporated into a Nazi state, the Independent State of Croatia. Belgrade became the seat of the Nedić regime, headed by General Milan Nedić. During the post-war period, Belgrade grew rapidly as the capital of the renewed Yugoslavia, developing as a major industrial center. In 1948, construction of New Belgrade started. In 1958, Belgrade's first television station began broadcasting. In 1961, the conference of Non-Aligned Countries was held in Belgrade under Tito's chairmanship. In 1962, Belgrade Nikola Tesla Airport was built. In 1968, major student protests against Tito led to several street clashes between students and the police. FEST is an annual film festival that has been held in Belgrade, Serbia since 1971, and, through 2013, had been attended by four million people and had presented almost 4,000 films. The festival is usually held in the first quarter of the year. During its early years, it was the only film festival in socialist countries that attracted big Hollywood stars such as Jack Nicholson, Kirk Douglas, Robert De Niro and directors like Miloš Forman, Francis Ford Coppola, Gina Lollobrigida etc. According to official results from the 2011 Census, Belgrade has a population of 1,344,844 within the city centre and 1,659,440 in the entire City of Belgrade area. According to the 2002 census, the main population groups according to nationality in the city municipality of Belgrade are: Serbs (1,417,187), Yugoslavs (22,161), Montenegrins (21,190), Roma (19,191), Croats (10,381), Macedonians (8,372), and Muslims by nationality (4,617). Although there are several historic religious communities in Belgrade, the religious makeup of the city is relatively homogenous. The Serbian Orthodox community is by far the largest, with 1,429,170 adherents. There are also 20,366 Muslims, 16,305 Roman Catholics, and 3,796 Protestants. There once was a significant Jewish community in Belgrade, but following the World War II Nazi occupation of the city, and subsequent Jewish emigration, their numbers have fallen from more than 10,000 to 2,200. Belgrade is the financial centre of Serbia, and is home to the country's National Bank. Currently, over 600,000 people are employed in 130,000 economic operators, 22,600 enterprises and 50,000 shops. Many notable companies are based in Belgrade, including Jat Airways, Telekom Srbija, Telenor Serbia, Delta Holding, Elektroprivreda Srbije, Komercijalna banka, Ikarbus, regional centers for AXA, Société Générale, Asus, Intel, Motorola, Dell, Samsung, MTV Adria, Kraft Foods, Carlsberg, Microsoft, OMV, Delhaize Group Unilever, Zepter, Maquet, Japan Tobacco, Sinohydro Corporation, P&G, and many others. Stocks are traded at the Belgrade Stock Exchange. New Belgrade is the main business district in the country and South East Europe. It is the fastest business development district with hotels, congress halls (such as the Sava Centar), class A and class B office buildings, sporting facilities such as the Belgrade Arena, shopping malls such as the ones in Ušće and Delta City, business parks such as Airport City Belgrade. The Belgrade Stock Exchange is also located in New Belgrade. Currently, over 1.2 million square meters of land is under construction in New Belgrade and the estimated value of construction in the next two and half years is over 1.5 billion Euros. Serbia overcame the problems of inflation in the mid 1990s, and Belgrade has been growing strongly ever since. As of 2009, over 40% of Serbia's GDP is generated by the city, which also has 31.4% of Serbia's employed population. In June 2012, the average monthly net salary in Belgrade was 52,500 RSD (€473, $631),while bruto salary (€ 694,$ 925). According to the Eurostat methodology, and contrasting sharply to the Balkan region, 53% of the city's households own a computer. According to the same survey, 66.2% of Belgrade's households have an internet connection; these figures are above those of the regional capitals such as Sofia, Bucharest and Athens.</> The city of Belgrade's 2012 GDP at purchasing power parity PPP is estimated at $30.8 Billion USD, which is $18,481 per capita in terms of purchasing power parity. Belgrade hosts many annual international cultural events, including the Film Festival, Theatre Festival, Summer Festival, Music Festival, Book Fair, and the Beer Fest. The Nobel Prize winning author Ivo Andrić wrote his most famous work, The Bridge on the Drina, in Belgrade. Other prominent Belgrade authors include Branislav Nušić, Miloš Crnjanski, Borislav Pekić, Milorad Pavić and Meša Selimović. Internationally Belgrade prominent artist: Marina Abramović and Milovan Destil Marković. Most of Serbia's film industry is based in Belgrade. The most prominent museum in Belgrade is the National Museum, founded in 1844 and currently closed for reconstruction. The Museum houses a collection of more than 400,000 exhibits, (over 5600 paintings and 8400 drawings and prints, including many foreign masters like Hieronymus Bosch, Juan de Flandes, Titian, Tintoretto, Rubens, Anthony van Dyck, Cezanne, Giovanni Battista Tiepolo, Renoir, Monet, Picasso, Gauguin, Van Gogh, Mondrian etc., and also the famous Miroslav's Gospel. The Ethnographic Museum, established in 1901, contains more than 150,000 items showcasing the rural and urban culture of the Balkans, particularly the countries of former Yugoslavia. The Museum of Contemporary Art has a collection of around 35,000 works including Andy Warhol, Joan Miró, Ivan Meštrović and others since 1900. The Military Museum houses a wide range of more than 25,000 military exhibits dating as far back as to the Roman period, as well as parts of a F-117 stealth aircraft shot down by the Serbian army. The Museum of Aviation in Belgrade has more than 200 aircraft, of which about 50 are on display, and a few of which are the only surviving examples of their type, such as the Fiat G.50. This museum also displays parts of shot down US and NATO aircraft, such as the F-117 and F-16 The Nikola Tesla Museum, founded in 1952, preserves the personal items of Nikola Tesla, the inventor after whom the Tesla unit was named. It holds around 160,000 original documents and around 5,700 other items. The last of the major Belgrade museums is the Museum of Vuk and Dositej, which showcases the lives, work and legacy of Vuk Stefanović Karadžić and Dositej Obradović, the 19th century reformer of the Serbian literary language and the first Serbian Minister of Education, respectively. Belgrade also houses the Museum of African Art, founded in 1977, which has the large collection of art from West Africa. With around 95,000 copies of national and international films, the Yugoslav Film Archive is the largest in the region and among the 10 largest archives in the world. The institution also operates the Museum of Yugoslav Film Archive, with movie theatre and exhibition hall. The archive's long-standing storage problems were finally solved in 2007, when a new modern depository was opened. The Belgrade Museum will move into a new building in Nemanjina Street, downtown. The Museum has interesting exhibits such as the Belgrade Gospel (1503), full plate armour from the Battle of Kosovo, and various paintings and graphics. In 2011, construction will start on a new Museum of Science and Technology. Ada Ciganlija is a former island on the Sava river, and Belgrade's biggest sports and recreational complex. Today it is connected with the right bank of the Sava via two causeways, creating an artificial lake. It is the most popular destination for Belgraders during the city's hot summers. There are 7 kilometres of long beaches and sports facilities for various sports including golf, football, basketball, volleyball, rugby union, baseball, and tennis. During summer there are between 200,000 and 300,000 bathers daily. Clubs work 24 hours a day, organizing live music and overnight beach parties. Extreme sports are available, such as bungee jumping, water skiing, and paintballing. There are numerous tracks on the island, where it is possible to ride a bike, go for a walk, or go jogging. Apart from Ada, Belgrade has total of 16 islands on the rivers, many still unused. Among them, the Great War Island at the confluence of Sava, stands out as an oasis of unshattered wildlife (especially birds). These areas, along with nearby Small War Island, are protected by the city's government as a nature preserve. Tourist income is annually around 500 million Euros. A more traditional Serbian nightlife experience, accompanied by traditional music known as Starogradska (roughly translated as Old Town Music), typical of northern Serbia's urban environments, is most prominent in Skadarlija, the city's old bohemian neighborhood where the poets and artists of Belgrade gathered in the 19th and early 20th centuries. Skadar Street (the centre of Skadarlija) and the surrounding neighbourhood are lined with some of Belgrade's best and oldest traditional restaurants (called kafanas in Serbian), which date back to that period. At one end of the neighbourhood stands Belgrade's oldest beer brewery, founded in the first half of the 19th century. One of the city's oldest kafanas is the Znak pitanja. Serbian tennis player Novak Đoković was born in Belgrade. He is a six-time Grand Slam champion and is the current ATP World No. 1. The Belgrade Arena in New Belgrade is one of the largest indoor arenas in Europe with a maximum capacity of 25,000. According to the European Arenas Association, the Belgrade Arena is the largest European indoor arena with capacity of 25.000. It is used for various sporting events such as Basketball, Volleyball and Davis Cup matches, and in May 2008 it was the venue for the 2008 Eurovision Song Contest. The Pionir Hall is the main venue of KK Partizan, European champion of 1992 and KK Crvena zvezda in Basketball competitions while the Tašmajdan Sports Centre is used for swimming competitions and Water Polo matches. The headquarters of Serbian radio and television broadcaster B92 in New Belgrade. Belgrade is the most important media hub in Serbia. The city is home to the main headquarters of the national broadcaster Radio Television Serbia – RTS, which is a public service broadcaster. The most popular commercial broadcaster is RTV Pink, a Serbian media multinational, known for its popular entertainment programs. The most popular commercial "alternative" broadcaster is B92, another media company, which has its own TV station, radio station, and music and book publishing arms, as well as the most popular website on the Serbian internet. Other TV stations broadcasting from Belgrade include 1Prva (formerly Fox televizija), Avala, Košava, and others which only cover the greater Belgrade municipal area, such as Studio B. Numerous specialised channels are also available: SOS channel (sport), Metropolis (music), Art TV (art), Cinemania (film), and Happy TV (children's programs). Paton, Andrew Archibald (4 November 2005)  (Reprint by Project Gutenberg/Project Rastko). Servia, Youngest Member of the European Family: or, A Residence in Belgrade, and Travels in the Highlands and Woodlands of the Interior, during the years 1843 and 1844.. London: Longman, Brown, Green and Longmans. http://pge.rastko.net/dirs/1/6/9/9/16999/16999-h/16999-h.htm. Retrieved 22 July 2009. ^ "Ancient Period". City of Belgrade. 5 October 2000. http://www.beograd.rs/cms/view.php?id=201172. Retrieved 16 November 2010. ^ "Territory". City of Belgrade. http://www.beograd.rs/cms/view.php?id=201197. Retrieved 6 May 2009. ^ "Geographical position". City of Belgrade. http://www.beograd.rs/cms/view.php?id=201029. Retrieved 10 July 2007. ^ a b "Why invest in Belgrade?". City of Belgrade. http://www.beograd.rs/cms/view.php?id=1299561. Retrieved 11 October 2010. ^ a b c "Discover Belgrade". City of Belgrade. Archived from the original on 18 May 2009. http://www.beograd.rs/cms/view.php?id=320. Retrieved 5 May 2009. ^ a b Rich, John (1992). The City in Late Antiquity. CRC Press. p. 113. ISBN 978-0-203-13016-2. http://books.google.com/?id=_uMP91pRf0UC&pg=PA113. Retrieved 5 May 2009. ^ "The History of Belgrade". BelgradeNet Travel Guide. http://www.belgradenet.com/belgrade_history_middle_ages.html. Retrieved 5 May 2009. ^ Robert Nurden (22 March 2009). "Belgrade has risen from the ashes to become the Balkans' party city". London: Independent. Archived from the original on 26 March 2009. http://web.archive.org/web/20090326054925/http://www.independent.co.uk/travel/europe/belgrade-has-risen-from-the-ashes-to-become-the-balkans-party-city-1651037.html?. Retrieved 5 May 2009. ^ a b "Assembly of the City of Belgrade". City of Belgrade. http://www.beograd.rs/cms/view.php?id=201014. Retrieved 10 July 2007. ^ a b c "Urban Municipalities". Official website. http://www.beograd.rs/cms/view.php?id=201906. Retrieved 10 July 2007. ^ a b "2011 Census first estimates". http://www.b92.net/biz/vesti/srbija.php?yyyy=2011&mm=10&dd=19&nav_id=550626. Retrieved 19 October 2011. ^ "Geographical Position". Official website. http://www.beograd.rs/cms/view.php?id=201029. Retrieved 10 July 2007. ^ "Natural Features". Official site. http://www.beograd.rs/cms/view.php?id=201033. Retrieved 12 December 2012. ^ Peel, M. C., Finlayson, B. L. and McMahon, T. A. (2007.). "Updated world map of the Köppen-Geiger climate classification". Hydrol. Earth Syst. Sci. (11). ^ m&c News (24 July 2007). "Record-breaking heat measured in Belgrade". http://news.monstersandcritics.com/europe/news/article_1334095.php/Record-breaking_heat_measured_in_Belgrade. Retrieved 10 August 2007. ^ "Climate". Official website. http://www.beograd.rs/cms/view.php?id=201193. Retrieved 10 July 2007. ^ "Belgrade Fortress history". Public Enterprise "Belgrade Fortress". http://www.beogradskatvrdjava.co.rs/Belgrade-Fortress-history_2178-74_2176. Retrieved 18 January 2011. ^ "Constantine I – Britannica Online Encyclopedia". Britannica.com. Archived from the original on 27 May 2009. http://www.britannica.com/eb/article-9109633/Constantine-I. Retrieved 7 July 2009. ^ "Philologic Results-". Artfl.uchicago.edu. http://artfl.uchicago.edu/cgi-bin/philologic/getobject.pl?c.25:1:283.harpers. Retrieved 7 July 2009. ^ "City of Belgrade – Ancient Period". Beograd.rs. 5 October 2000. http://www.beograd.rs/cms/view.php?id=201172. Retrieved 7 July 2009. ^ J. B. Bury (2009) . History of the Later Roman Empire from Arcadius to Irene Vol. II. New York: Cosimo Classics. p. 117. ISBN 978-1-60520-405-5. http://books.google.com/?id=wDIJNvWb48YC. Retrieved 15 September 2011. ^ "History of Zemun". Geocities.com. 28 July 1914. Archived from the original on 24 October 2009. http://web.archive.org/web/20091024203240/http://geocities.com/kadezi/zemunhistory.html. Retrieved 7 July 2009. ^ "The History of Belgrade". Belgradenet.com. http://www.belgradenet.com/belgrade_history_ancient.html. Retrieved 16 November 2010. ^ a b c d "How to Conquer Belgrade – History". Beligrad.com. 16 December 1934. Archived from the original on 16 June 2009. http://www.beligrad.com/history.htm. Retrieved 7 July 2009. ^ "The History of Belgrade". Belgradenet.com. Archived from the original on 28 June 2009. http://www.belgradenet.com/belgrade_history.html. Retrieved 7 July 2009. ^ a b "History (Medieval Serbian Belgrade)". Official website. http://www.beograd.rs/cms/view.php?id=201247. Retrieved 10 July 2007. ^ "Battle of Maritsa". Encyclopaedia Britannica. Archived from the original on 14 June 2007. http://www.britannica.com/eb/article-9050991/Battle-of-the-Maritsa-River. Retrieved 10 July 2007. ^ "Battle of Kosovo". Encyclopaedia Britannica. Archived from the original on 26 June 2007. http://www.britannica.com/eb/article-9046112/Battle-of-Kosovo. Retrieved 10 July 2007. ^ Ćorović, Vladimir (1997). "V. Despot Đurađ Branković" (in Serbian). Istorija srpskog naroda. Banja Luka / Belgrade: Project Rastko. ISBN 86-7119-101-X. http://www.rastko.org.rs/rastko-bl/istorija/corovic/istorija/4_5_l.html. Retrieved 17 July 2007. ^ a b "The History of Belgrade". Belgradenet.com. http://www.belgradenet.com/belgrade_history_middle_ages.html. Retrieved 7 July 2009. ^ Tom R. Kovach. "Ottoman-Hungarian Wars: Siege of Belgrade in 1456". Military History magazine. Archived from the original on 26 June 2007. http://www.historynet.com/magazines/military_history/3030796.html. Retrieved 10 July 2007. ^ "Romanian Heritage | Heritage / JohnHunyadi". Wiki.viitorulroman.com. 15 October 2006. Archived from the original on 16 April 2008. http://web.archive.org/web/20080416055137/http://wiki.viitorulroman.com/pmwiki.php/Heritage/JohnHunyadi. Retrieved 7 July 2009. ^ "Hungary: A Brief History". Mek.oszk.hu. http://www.mek.oszk.hu/02000/02085/02085.htm. Retrieved 16 November 2010. ^ "The Rough Guide to Turkey: Belgrade Forest". Rough Guides. http://www.roughguides.co.uk/website/travel/Destination/content/default.aspx?titleid=104&xid=idh573385336_0211. Retrieved 5 May 2009. ^ a b "History (Turkish and Austrian Rule)". Official website. http://www.beograd.rs/cms/view.php?id=201251. Retrieved 10 July 2007. ^ Aleksov, Bojan (December 2003). "Nationalism In Construction: The Memorial Church of St. Sava on Vračar Hill In Belgrade". Balkanologie VII (47): 52–53. Retrieved on 15 September 2010. ^ "Belgrade Fortress: History". Razgledanje.tripod.com. 23 August 2004. http://razgledanje.tripod.com/tvrdjava/english.htm. Retrieved 7 July 2009. ^ Medaković, Dejan (1990). "Tajne poruke svetog Save" Svetosavska crkva i velika seoba Srba 1690. godine". Oči u oči. Belgrade: BIGZ (online reprint by Serbian Unity Congress library). ISBN 978-86-13-00903-0. Archived from the original on 30 September 2007. http://web.archive.org/web/20070930183543/http://www.suc.org/culture/library/Oci/tajne-poruke-svetoga-save-16-03-03.html. Retrieved 17 May 2007. ^ a b "History (Liberation of Belgrade)". Official website. http://www.beograd.rs/cms/view.php?id=201255. Retrieved 10 July 2007. ^ Pavkovic, Aleksandar (19 October 2001). "Nations into States: National Liberations in Former Yugoslavia". ^ "History". City of Kragujevac official website. http://www.kragujevac.rs/History-152-2. Retrieved 15 September 2010. ^ "History (Important Years Through City History)". Official website. http://www.beograd.rs/cms/view.php?id=201239. Retrieved 10 July 2007. ^ a b "History (The Capital of Serbia and Yugoslavia)". Official website. http://www.beograd.rs/cms/view.php?id=201259. Retrieved 10 July 2007. ^ Jan Lahmeyer (3 February 2003). "The Yugoslav Federation: Historical demographical data of the urban centers". www.populstat.info. http://www.populstat.info/Europe/yugoslft.htm. Retrieved 17 May 2007. "Belgrade and Smederevo" in the 1913 Catholic Encyclopedia – Retrieved on 16 October 2007. ^ Kosanovic, Dejan (1995). "Serbian Film and Cinematography (1896–1993)". The history of Serbian Culture. Porthill Publishers. ISBN 1-870732-31-6. http://www.rastko.org.rs/isk/dkosanovic-cinematography.html. Retrieved 10 July 2007. ^ "Serbia :: Belgrade". Balkanology. http://www.balkanology.com/serbia/article_belgrade.html. Retrieved 7 July 2009. ^ "Rebecca West's Constantine the Poet". Serbworldusa.com. http://www.serbworldusa.com/REBECCA%20WEST.html. Retrieved 16 November 2010. ^ "Serbia :: Vojvodina". Balkanology. http://www.balkanology.com/serbia/article_vojvodina.html. Retrieved 7 July 2009. ^ Petrović, Dragan (2001). "Industrija i urbani razvoj Beograda" (PDF). Industrija 21 (1–4): 87–94. ISSN 0350-0373. 0350-03730101087P. Retrieved on 10 July 2007. ^ "Twentieth Century – Innovations in Belgrade". Serbia-info.com (Government of Serbia website). Archived from the original on 18 January 2008. http://web.archive.org/web/20080118092237/http://www.serbia-info.com/g3/images/1930-50-e.htm. Retrieved 21 July 2007. ^ "Part Two the Yugoslav Campaign". The German campaign in the Balkans (Spring 1941). United States Army Center of Military History. 1986 . CMH Pub 104-4. Archived from the original on 19 June 2009. http://www.history.army.mil/books/wwii/balkan/20_260_2.htm. Retrieved 7 July 2009. ^ "Anniversary of the Allied Bomb Attacks Against Belgrade". Radio-Television of Serbia. 17 April 2008. http://www.spc.rs/eng/anniversary_allied_bomb_attacks_against_belgrade. Retrieved 5 May 2009. ^ "Tekstovi (Texts)". Napredniklub.org. http://www.napredniklub.org/tekstovi.php?subaction=showfull&id=1255532834&archive=&start_from=&ucat=1&. Retrieved 16 November 2010. ^ "Izmedju Srpa i Cekica (Between the hammer and sickle)". Scribd.com. 20 April 2009. http://www.scribd.com/doc/14429469/Izmedju-Srpa-i-Cekica. Retrieved 16 November 2010. ^ "Prvi udarac Miloševićevom režimu" (in Serbian). Danas. 9 March 2006. http://www.danas.rs/20060309/hronika1.html. Retrieved 10 July 2007. ^ James L. Graff (25 March 1991). "Yugoslavia: Mass bedlam in Belgrade". TIME. http://www.time.com/time/magazine/article/0,9171,972607-1,00.html. Retrieved 10 July 2007. ^ "Srbija na mitinzima (1990–1999)" (in Serbian). Vreme. 21 August 1999. Archived from the original on 19 June 2007. http://www.vreme.com/arhiva_html/450/2.html. Retrieved 10 July 2007. ^ "History (Disintegration Years 1988–2000)". Official website. http://www.beograd.rs/cms/view.php?id=201267. Retrieved 10 July 2007. ^ Jane Perlez (23 February 1997). "New Mayor of Belgrade: A Serbian Chameleon". The New York Times. http://select.nytimes.com/gst/abstract.html?res=F40616F83B5A0C708EDDAB0894DF494D81&n=Top%2fReference%2fTimes%20Topics%2fPeople%2fD%2fDjindjic%2c%20Zoran. Retrieved 17 May 2007. ^ "NATO bombing". Official website. http://www.beograd.rs/cms/view.php?id=201271. Retrieved 17 May 2007. ^ "Parties, citizens mark October 5". B92. 5 October 2007. Archived from the original on 18 April 2009. http://www.b92.net//eng/news/politics-article.php?yyyy=2007&mm=10&dd=05&nav_category=90&nav_id=44315. Retrieved 7 May 2009. ^ "October 5, 2000". City of Belgrade. http://www.beograd.rs/cms/view.php?id=201275. Retrieved 7 May 2009. ^ "Councilors of the Assembly of the City of Belgrade". Official site. http://www.beograd.rs/cms/view.php?id=201942. Retrieved 16 July 2007. ^ "Facts (Population)". Official website. http://www.beograd.rs/cms/view.php?id=201201. Retrieved 10 July 2007. ^ "Stranci tanje budžet". Novosti.rs. http://www.novosti.rs/code/navigate.php?Id=14&status=jedna&vest=120710&datum=2008-05-06. Retrieved 16 November 2010. ^ "Kinezi Marko, Miloš i Ana" (in Serbian). Kurir. 20 February 2005. http://arhiva.kurir-info.rs/Arhiva/2005/februar/19-20/B-01-19022005.shtml. Retrieved 18 July 2007. ^ Biljana Vasić (15 January 2001). "Kineska četvrt u bloku 70" (in Serbian). Vreme. Archived from the original on 15 July 2007. http://www.vreme.com/arhiva_html/471/10.html. Retrieved 18 July 2007. ^ Vesna Peric Zimonjic (7 December 2005). "A unique friendship club in Belgrade". Dawn – International. Archived from the original on 27 September 2007. http://web.archive.org/web/20070927225101/http://www.dawn.com/2005/12/07/int17.htm. Retrieved 17 July 2007. ^ "Chinese and Iraqi immigrants receive quiet welcome". international. 31 May 2007. http://ins.onlinedemocracy.ca/index.php?name=News&file=article&sid=9214. Retrieved 4 October 2007. ^ "Jevrejska verska zajednica". Grad Beograd. http://www.beograd.rs/cms/view.php?id=1408. Retrieved 16 February 2007. ^ "Svjetski lider u osiguranju Aksa odabrao Beograd za centar regiona". Trazimkredit.com. 17 June 2011. http://www.trazimkredit.com/novosti/1783-svjetski-lider-u-osiguranju-aksa-odabrao-beograd-za-centar-regiona.html. Retrieved 15 September 2011. ^ "Asus otvorio regionalni centar u Beogradu:: emportal:: Ekonomske vesti iz Srbije". Emportal.rs. http://www.emportal.rs/vesti/srbija/62935.html. Retrieved 16 November 2010. ^ "Centar kompanije 'Intel' za Balkan u Beogradu – Srbija deo 'Intel World Ahead Program'". E kapija. http://www.ekapija.com/website/sr/page/140159. Retrieved 7 July 2009. ^ "Vesti dana: MTV se preselio u Beograd: POLITIKA". Politika.rs. http://www.politika.rs/rubrike/vesti-dana/MTV-se-preselio-u-Beograd.lt.html. Retrieved 25 July 2009. ^ "Beograd će biti regionalni centar:: emportal:: Ekonomske vesti iz Srbije". Emportal.rs. http://www.emportal.rs/vesti/srbija/40020.html. Retrieved 16 November 2010. ^ "Beograd konkuriše Beču". Politika. 21 February 2008. http://www.politika.rs/rubrike/Ekonomija/Beograd-konkurishe-Bechu.lt.html. Retrieved 5 May 2009. ^ "Procter&Gamble Belgrade". Pgbalkans.com. http://www.pgbalkans.com/yu/contact.asp. Retrieved 16 November 2010. ^ "JTI u Srbiju ulaže oko $100 mil" (in Serbian). B92 Biz. 24 April 2007. Archived from the original on 24 May 2007. http://www.b92.net/biz/vesti/srbija.php?yyyy=2007&mm=04&dd=24&nav_id=243493&fs=1. Retrieved 19 May 2007. ^ "Privreda Beograda" (in Serbian). Economic Chamber of Belgrade. http://www.kombeg.org.rs/Komora/centri/CentarZaEkonomskuPolitiku.aspx?veza=3014. Retrieved 19 January 2010. ^ "U Srbiji sve više računara". Politika.rs. http://www.politika.rs/rubrike/Drustvo/U-Srbiji-sve-vishe-rachunara.lt.html. Retrieved 7 July 2009. ^ "Culture and Art (Cultural Events)". Official website. http://www.beograd.rs/cms/view.php?id=201299. Retrieved 10 July 2007. ^ "The biography of Ivo Andrić". The Ivo Andrić Foundation. http://www.ivoandric.org.rs/html/biography.html. Retrieved 18 May 2007. ^ "Borislav Pekić – Biografija" (in Serbian). Project Rastko. http://www.rastko.org.rs/knjizevnost/nauka_knjiz/pekic-biograf.html. Retrieved 19 May 2007. ^ Joseph Tabbi (26 July 2005). "Miloš Crnjanski and his descendents". Electronic Book Review. Archived from the original on 11 July 2007. http://www.electronicbookreview.com/thread/internetnation/sumatrism. Retrieved 10 July 2007. ^ "Meša Selimović – Biografija" (in Bosnian). Kitabhana.net. Archived from the original on 16 July 2007. http://www.xs4all.nl/~eteia/kitabhana/Selimovic_Mehmed_Mesa/Biografija.html. Retrieved 10 July 2007. ^ "Beogradska rock scena je otišla u ilegalu" (in Serbian). Glas.ba. http://www.glas.ba/index.php?p=2&clid=3342&kadid=71&otv=13&pg=1. Retrieved 18 January 2011. ^ John Shepherd (2005). Continuum encyclopedia of popular music of the world. 3–7. Continuum. p. 142. ISBN 978-0-8264-7436-0. ^ Aleksandar Pavlić (9 February 2005). "Beogradski Sindikat: Svi Zajedno" (in Serbian). Popboks magazine. Archived from the original on 13 May 2007. http://www.popboks.com/albumi/beogradskisindikat.shtml. Retrieved 23 May 2007. ^ S. S. Todorović (30 January 2004). "Liričar među reperima" (in Serbian). Balkanmedia. http://www.balkanmedia.com/m2/doc/3184-1.shtml. Retrieved 23 May 2007. ^ Institut français de Serbie - Qui sommes-nous ? ^ "Serbian ballad wins Eurovision Song Contest – Belgrade hosts in 2008". Helsingin Sanomat. 14 May 2007. http://www.hs.fi/english/article/Serbian+ballad+wins+Eurovision+Song+Contest+-+Belgrade+hosts+in+2008+/1135227223254. Retrieved 10 July 2007. ^ Tatjana Cvjetićanin. "From the history of the National Museum in Belgrade". National Museum of Serbia. http://www.narodnimuzej.rs/code/navigate.php?Id=75. Retrieved 27 July 2007. ^ "Museums 3". Official website. http://www.beograd.rs/cms/view.php?id=201167. Retrieved 10 July 2007. ^ "Museums 2". Official website. http://www.beograd.rs/cms/view.php?id=201055. Retrieved 10 July 2007. ^ "Museums". Official website. http://www.beograd.rs/cms/view.php?id=201283. Retrieved 10 July 2007. ^ "Military Museum". Lonely Planet. http://www.lonelyplanet.com/serbia/belgrade/sights/museum/military-museum. Retrieved 18 January 2010. ^ "Lična karta Muzeja ratnog vazduhoplovstva" (in Serbian). Museum of Air force Belgrade. Archived from the original on 28 May 2006. http://web.archive.org/web/20060528075833/http://www.muzejrv.org/istorija/istorija.html. Retrieved 19 May 2007. ^ "About the museum". Nikola Tesla Museum. Archived from the original on 10 June 2007. http://www.tesla-museum.org/meni_en/nt.php?link=muzej/m&opc=sub2. Retrieved 10 July 2007. ^ "City of Belgrade – Museums 1". Official website. http://www.beograd.rs/cms/view.php?id=201051. Retrieved 10 July 2007. ^ "Cultural institutions: Museum of African Art". Official website. http://www.beograd.rs/cms/view.php?id=202308. Retrieved 10 July 2007. ^ "Action programme 2006 for Serbia: Support to the Yugoslav Film Archive" (PDF). European Agency for Reconstruction. 1 January 2006. Archived from the original on 2 August 2007. http://www.ear.europa.eu/serbia/main/documents/2006Media.pdf. Retrieved 10 July 2007. ^ "New Depository for the Yugoslav Film Archive's treasure". SEECult.org, Culture Portal of Southeastern Europe. 7 June 2007. Archived from the original on 11 October 2007. http://web.archive.org/web/20071011202918/http://seecult.org/english/module-News-display-sid-211.html. Retrieved 10 July 2007. ^ Nicholas Comrie, Lucy Moore (1 October 2007). "Zemun: The Town Within the City". B92 Travel. http://www.b92.net/eng/travel/index.php?nav_id=38986. Retrieved 17 May 2007. ^ a b c d e Zoran Manević. "Architecture and Building". MIT website. http://web.mit.edu/most/www/ser/Belgrade/zoran_manevic.html. Retrieved 19 May 2007. ^ Prof. Dr. Mihajlo Mitrović (27 June 2003). "Seventh Belgrade triennial of world architecture". ULUS. http://www.ulus.org.rs/ENGLISH/Exhibitions/TriennialA/TriennialA.htm. Retrieved 19 May 2007. ^ Laura Wolfs (21 June 2010). "A Palacial Tour". Balkan Insight. http://old.balkaninsight.com/en/main/life_and_style/28895/. Retrieved 18 September 2011. ^ a b c "Ada Ciganlija". Tourist Organization of Belgrade. Archived from the original on 29 August 2010. http://web.archive.org/web/20100829140413/http://www.tob.co.rs/eng/index.php?option=com_content&task=view&id=167&Itemid=281. Retrieved 15 September 2010. ^ LivingInBelgrade.com. "Ada: Too Early for Swimming". Belgrade. Archived from the original on 1 Feb 2013. http://livinginbelgrade.com/news.php?idNews=224. ^ a b "Sport Activities in Belgrade". Archived from the original on 2013-01-01. http://livinginbelgrade.com/activities.php. ^ Ana Nikolov (29 July 2005). "Beograd – grad na rekama". Retrieved on 5 June 2007. ^ "Zbogom, oazo!" (in Serbian). Kurir. 23 May 2006. http://arhiva.kurir-info.rs/Arhiva/2006/maj/23/B-01-23052006.shtml. Retrieved 5 June 2007. ^ Beoinfo (4 August 2005). "Prirodno dobro "Veliko ratno ostrvo" stavljeno pod zaštitu Skupštine grada" (in Serbian). Ekoforum. http://www.ekoforum.org/index/vest.asp?vID=181. Retrieved 5 June 2007. ^ Eve-Ann Prentice (10 August 2003). "Why I love battereBelgrade". London: The Guardian Travel. Archived from the original on 15 May 2007. http://travel.guardian.co.uk/article/2003/aug/10/observerescapesection1. Retrieved 19 May 2007. ^ Seth Sherwood (16 October 2005). "Belgrade Rocks". The New York Times. http://www.nytimes.com/2005/10/16/travel/16belgrade.html?ex=1287115200&en=4cd8ccf41a41542c&ei=5088. Retrieved 19 May 2007. ^ Barbara Gruber (22 August 2006). "Belgrade's Nightlife Floats on the Danube". Deutsche Welle. Archived from the original on 16 June 2007. http://www.dw-world.de/dw/article/0,2144,2129528,00.html. Retrieved 19 May 2007. ^ "Slovenci dolaze u jeftin provod" (in Serbian). Glas Javnosti. 21 December 2004. http://www.b92.net/info/vesti/pregled_stampe.php?yyyy=2004&mm=12&dd=21&nav_id=158386. Retrieved 10 July 2007. ^ "U Beograd na vikend-zabavu" (in Croatian). Večernji list. 6 January 2006. Archived from the original on 6 January 2006. http://www.b92.net/info/vesti/pregled_stampe.php?yyyy=2006&mm=01&dd=08&nav_id=184523. Retrieved 15 June 2007. ^ Gordy, Eric D. (1999). "The Destruction of Musical Alternatives". The Culture of Power in Serbia: Nationalism and the Destruction of Alternatives. Penn State Press. pp. 121–122. ISBN 0-271-01958-1. http://books.google.com/?id=WqoZsrmYZQIC&dq=Belgrade+KST. Retrieved 10 July 2007. ^ "Intro". Club "Akademija". http://www.akademija.net/remote/?call=2&lg=2. Retrieved 10 July 2007. ^ "Klub Studenata Tehnike – O nama" (in Serbian). http://www.kst.org.rs/. ^ David Galić (22 February 2010). "Studentski Kulturni Centar". Balkan Insight. http://www.balkaninsight.com/en/article/studentski-kulturni-centar. Retrieved 19 January 2011. ^ "Skadarlija". Tourist Organisation of Belgrade. http://www.tob.rs/en/see.php?kat=9. Retrieved 19 January 2011. ^ "Beogradska Industrija Piva AD". SEE News. Archived from the original on 26 April 2009. http://www.seenews.com/profiles/companies/cs_bip_beogradska_industrija_piva/. Retrieved 5 May 2009. ^ "Znamenite građevine 3" (in Serbian). Official site. http://www.beograd.rs/cms/view.php?id=1319. Retrieved 10 July 2007. ^ Scurlock, Gareth (4 November 2008). "Europe's best nightlife". London: Official site. http://www.timesonline.co.uk/tol/travel/holiday_type/music_and_travel/article5082856.ece. Retrieved 11 April 2008. 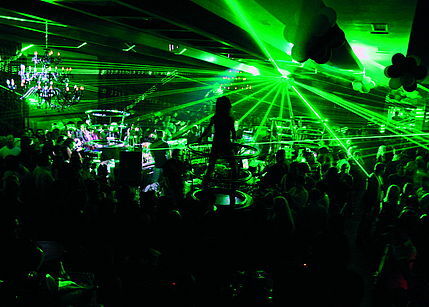 ^ "The world's top 10 party towns". The Sydney Morning Herald. 9 November 2009. Archived from the original on 10 April 2010. http://www.smh.com.au/travel/the-worlds-top-10-party-towns-20091118-im4q.html. Retrieved 16 March 2010. ^ "Sport and Recreation". Official website. http://www.beograd.rs/cms/view.php?id=201508. Retrieved 10 July 2007. ^ "Universiade 2009 (Belgrade)". FISU. Archived from the original on 9 February 2008. http://web.archive.org/web/20080209234741/http://www.fisu.net/site/page_1068.php. Retrieved 19 May 2007. ^ "Belgrade Arena Profile". Belgrade Arena. http://www.arenabeograd.com/en/page/61/Arena+Profile. Retrieved 28 May 2012. ^ "Sport and Recreation (Stadiums)". Official website. http://www.beograd.rs/cms/view.php?id=201754. Retrieved 10 July 2007. ^ "Sport and Recreation (Sport Centers and Halls)". Official website. http://www.beograd.rs/cms/view.php?id=201758. Retrieved 10 July 2007. ^ "Venues". EYOF Belgrade 2007. http://www.beograd2007.org/index.php?option=com_content&task=view&id=20&Itemid=131&limit=1&limitstart=3&lang=en. Retrieved 30 July 2007. ^ "Tipsarevic sends Serbia into first Davis Cup final". Davis Cup official website. 19 September 2010. http://www.daviscup.com/en/news/articles/tipsarevic-sends-serbia-into-first-davis-cup-final.aspx. Retrieved 20 September 2010. ^ "O nama" (in Serbian). Belgrade Fashion Week. http://www.belgradefashionweek.com/srpski/onama.php. ^ "Nagrade za kraj" (in Serbian). Press. 9 November 2008. http://www.pressonline.rs/sr/vesti/Dnevni_magazin/story/185819/Nagrade+za+kraj.html. ^ "Medijski javni servis građana" (in Serbian). Radio Television of Serbia. 13 November 2008. http://www.rts.rs/page/rts/sr/javniservis/RTS+50/story/251/I+danas/27294/Medijski+javni+servis+gra%C4%91ana.html. ^ Jared Manasek (2005-01). "The Paradox of Pink". Columbia Journalism Review. Archived from the original on 30 September 2007. http://web.archive.org/web/20070930033327/http://www.cjr.org/issues/2005/1/manasek-paradox.asp. Retrieved 19 May 2007. ^ "B92 na 8.598. mestu na svetu" (in Serbian). B92. 1 September 2006. http://www.b92.net/info/vesti/index.php?yyyy=2006&mm=09&dd=01&nav_category=15&nav_id=210237&fs=1. Retrieved 19 May 2007. ^ "The University of Belgrade – The Seedbed of University Education". Faculty of Law of University of Belgrade. http://www.ius.bg.ac.rs/eng/university_of_belgrade.htm. Retrieved 18 May 2007. ^ "Word by the Rector". University of Belgrade. http://www.bg.ac.rs/eng/uni/en_recrektora.php. Retrieved 19 January 2011. ^ "Education and Science". City of Belgrade. http://www.beograd.rs/cms/view.php?id=201008. Retrieved 10 July 2007. ^ "Statistics". Public Transport Company "Belgrade". http://www.gsp.rs/english/statistic.htm. Retrieved 19 May 2007. ^ "Belgrade Bypass, Serbia". CEE Bankwatch network. Archived from the original on 4 March 2007. http://web.archive.org/web/20070304135012/http://www.bankwatch.org/project.shtml?w=147584&s=1961998. Retrieved 19 May 2007. ^ "1. faza prve deonice Unutrašnjeg magistralnog poluprstena" (in Serbian) (PDF). Belgrade Direction for Building and Real Estate Land/EBRD. 1 July 2005. Archived from the original on 9 August 2007. http://web.archive.org/web/20070809064808/http://www.ebrd.com/projects/eias/34913s.pdf. Retrieved 15 September 2007. ^ "Luka Beograd AS – Istorijat [History of the Port of Belgrade]" (in Serbian). Port of Belgrade. http://www.lukabeograd.com/ONama/Istorijat.html. Retrieved 11 October 2010. ^ "Airports and Flying fields". Aviation guide through Belgrade. http://www.vazduhoplovnivodic.rs/eng/eng_letelista.htm. Retrieved 5 May 2009. ^ "Regionalni centar putničkog i kargo saobraćaja" (in Serbian). Danas. 20 May 2005. http://www.danas.rs/20050520/ekonomija1.html. Retrieved 10 July 2007. ^ "www.beg.aero | Nikola Tesla Belgrade Airport | News". Airport-belgrade.rs. http://www.airport-belgrade.rs/code/navigate.php?Id=63. Retrieved 7 July 2009. ^ "Železnice Srbije – Red voznje za Beovoz i BG:VOZ". Serbian railways. http://www.srbrail.rs/redvoznje1/Beovoz.aspx. ^ "International Cooperation". Official website. http://www.beograd.rs/cms/view.php?id=1225698. Retrieved 10 July 2007. ^ "Beograd: Međunarodni odnosi". Stalna konferencija gradova i opština Srbije. Archived from the original on 27 September 2007. http://web.archive.org/web/20070927021427/http://www.skgo.org/php/opstine/detalji.php?Id=12&IdSvojstva=MO. Retrieved 18 June 2007. ^ "Council okays peace committees: Lahore and Chicago to be declared twin cities". The Post. 28 January 2007. http://thepost.com.pk/Arc_CityNews.aspx?dtlid=79932&catid=3&date=01/28/2007&fcatid=14. Retrieved 16 May 2007. ^ "Bratimljenje Beograda i Krfa". B92. http://www.b92.net/info/vesti/index.php?yyyy=2010&mm=02&dd=25&nav_category=12&nav_id=414000. Retrieved 25 February 2010. ^ "Sister Cities". Beijing Municipal Government. http://www.ebeijing.gov.cn/Sister_Cities/Sister_City/. Retrieved 23 September 2008. ^ "Saradnja Beograda i Šendžena". B92. http://www.b92.net/info/vesti/index.php?yyyy=2009&mm=07&dd=11&nav_category=12&nav_id=370774. Retrieved 11 July 2009. ^ "Invitation for fraternization of Havana and Belgrade". Mfa.gov.rs. http://www.mfa.gov.rs/Bilteni/Engleski/b290507_e.html#N10. Retrieved 17 April 2010. ^ "Received Decorations". Official website. http://www.beograd.rs/cms/view.php?id=201227. Retrieved 16 May 2007. ^ "Beograd – grad heroj". RTV Pink. 6 November 2009. http://www.rtvpink.com/vesti/vest.php?id=26907. Retrieved 15 November 2009. ^ "European Cities of the Future 2006/07". fDi magazine. 6 February 2006. Archived from the original on 27 September 2007. http://web.archive.org/web/20070927004828/http://www.fdimagazine.com/news/fullstory.php/aid/1543. Retrieved 10 July 2007. ^ Aleksandar Miloradović (1 September 2006). "Belgrade – City of the Future in Southern Europe" (PDF). TheRegion, magazine of SEE Europe. Archived from the original on 8 August 2007. http://www.seeurope.net/files2/pdf/rgn0906/13_Belgrade_CityOfTheFutureInSEE.pdf. Retrieved 10 July 2007. This page uses content from the English language Wikipedia. The original content was at Belgrade. The list of authors can be seen in the page history. As with this Familypedia wiki, the content of Wikipedia is available under the Creative Commons License.